Ramblings of a Young Mama: It's nearly 4 am and I can't sleep. It's nearly 4 am and I can't sleep. 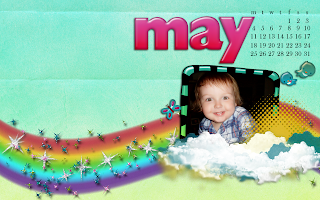 So just like every month I have uploaded my May desktop for you all to see! I'm a few days late, but hey it's ok. :] This one comes from Laura on the Studio Tangie CT! Isn't it super cute?! and of course my darling son just makes it even better! ;) You can click the preview to get a full size view :) It's a little larger than the normal desktops, but it fits to the size of the screen & looks GREAT! Friday Fill-Ins #126, I forgot #125.. I had a mini photo shoot..